Incandescent Halogen Searchlights Archives | The Carlisle & Finch Co. This searchlight has a National Stock Number, and is used by the U.S. Navy and U.S. Coast Guard. It can be ordered in two aiming configurations, and is mounted on a heavy duty Cast Base and Yoke. 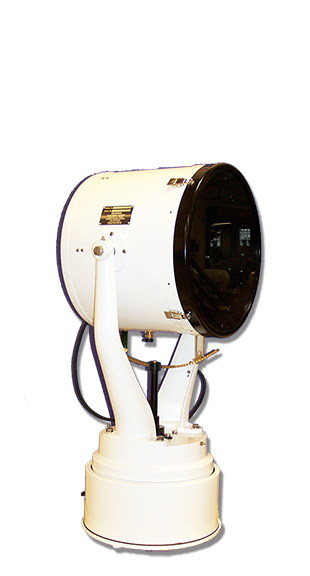 This searchlight family is used widely throughout the U.S. Navy, U.S. Coast Guard and worldwide for Commercial Marine and Security Searchlight Applications. It is a rugged, high quality Brass and Stainless Fixture, with a powerful Searchlight Beam which will project from 1 to over 2KM, depending upon the fixture selected. The beam will immediately stop when the target is sighted, with built-in electric braking. The rotation is beyond a full circle (385°) with a unique sliding stop design. The anti-condensation heater will increase the life of the electrical parts in the base. 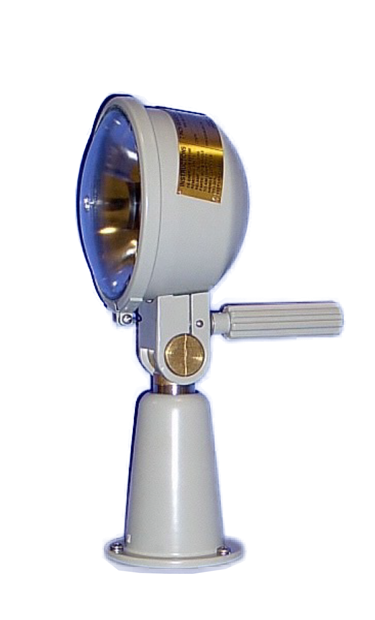 This searchlight product family is sold to a wide range of Commercial Marine Applications, such as Tug Boats and Offshore Oil Vessels, and has been sold to many prisons for security applications as well. 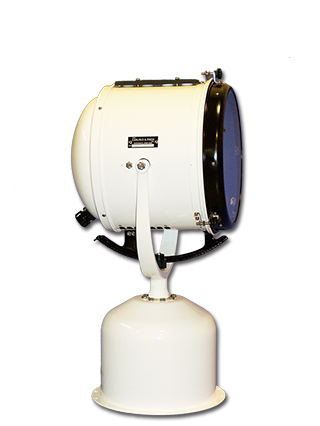 When the power of a xenon searchlight is not required, this product will still service a long distance, and hold up in the most rugged and challenging environments.